Since 1803, Ohio’s congressional districts have been have been redrawn dozens of times. At first, there were little federal criteria for how states drew their districts. In Ohio, redistricting is left up to the State Legislature – and Ohio’s Congressional district map changed very little from 1923-1943 -- even as the population grew, and shifted into cities like Cleveland. But in the mid-1960’s the U.S. Supreme Court stepped in and established the “one person, one vote” policy – and, through a series of decisions, it forced all states to redraw their districts to be roughly equal in population. So, after the 1960’s, we see a lot more redistricting activity – usually every 10 years, following a census. But these changing district lines are not necessarily a good thing. "If one party has control over the process, we have what's called partisan gerrymandering, and it means that they can draw the boundaries so that they win a disproportionate number of seats in congress from that state," said Dr. Mark Salling, an Associate Researcher at Cleveland State University. "It means that many people's vote don't really count as much as other people votes." 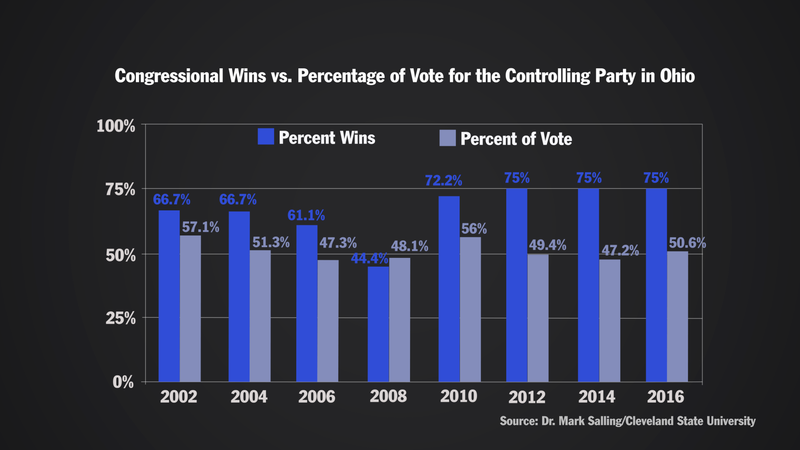 Salling has studied redistricting for the past 10 years -- and he says current technology makes the gerrymandering more efficient than ever before. "The consultants who work with the political parties on drawing boundaries have very precise data and tools to really maximize the gerrymandering process. For example, there's the process of packing in which you take the other party's members -- Democrat or Republican -- and put as many as you can in one district, and therefore eleminate their voting in other districts. It's a way of taking votes away from the other party, basically, and winning more seats than you would otherwise," said Salling. 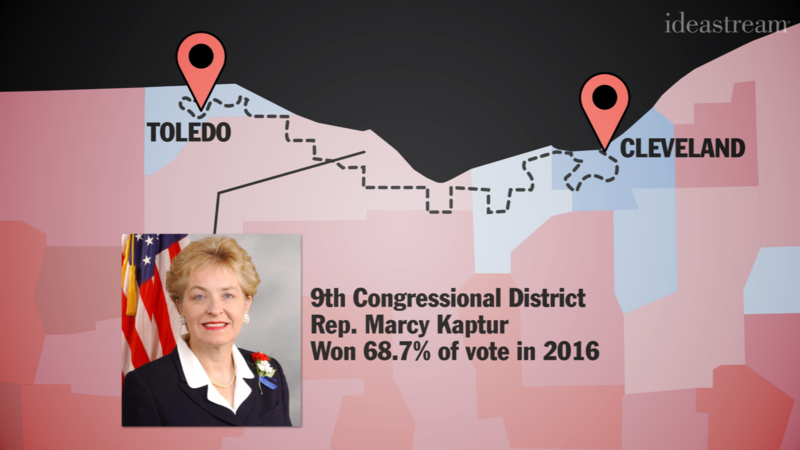 The 9th Congressional District -- which Rep. Marcy Kaptur won with 68.7% of the vote in 2016 -- is an example of a "packed" district. And this gerrymandering has been effective, said Salling, "As a result, the Republicans have a disproportionate number of congressional seats in Ohio than the number of votes they get statewide. So they win 60,70 percent of the seats in Ohio, even though they represent roughly 50% of the voters." 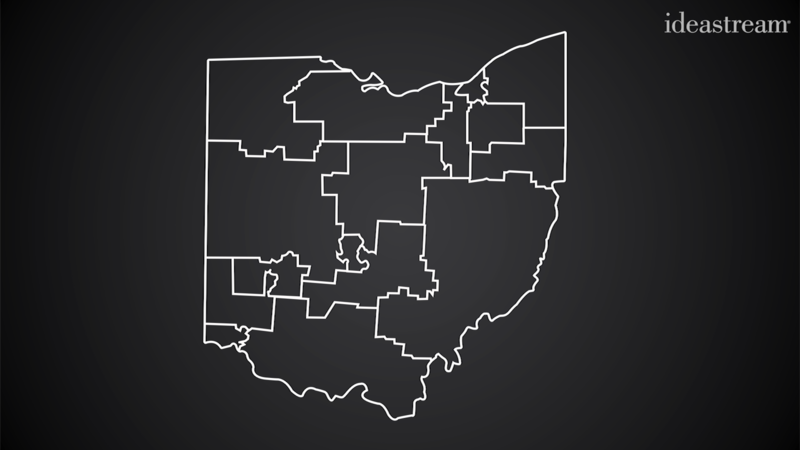 This map was created as an entry in a non-partisan competition sponsored by the League of Women Voters of Ohio, calling on citizens to try their hand at drawing the districts. It judged entries based on an expanded set of criteria, such as competitivness, representational fairness, and compactness. And, Salling said, the process of redrawing districts could be improved with public assistance, "We need a better process than what we have today, where the politicians pick their own districts where they want their voters to be. We want the citizens to be more involved. I think everyone would agree that it should be a more democratic process."